It's never too late to start loving better. Whether you're dating or married, currently single, learning to parent children or teenagers, or simply looking for new ways to connect with others and grow personally, there's a book for you. Browse the full 5 Love Language library below and find the one that's right for you! Love better. Grow closer. Subscribe to the 5 Love Languages® newsletter for new content, helpful suggestions, and sincere support delivered straight to your inbox. Learn new ways to speak all five of the Love Languages. Plus, get discount codes for featured resources and a link to author Gary Chapman’s podcast! YES! Email me free practical tips, special offers, and resources to strengthen my relationships from Dr. Gary Chapman and The 5 Love Languages®. Now that I know my love language, how can I start using it? Introducing Love Nudge™ For Couples Strong Connection = Strong Marriage = Strong Family. 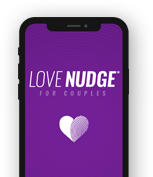 Based on the principles of The Five Love Languages®, LOVE NUDGE empowers couples to discover how they express love - and provides practical tools to do just that. This interactive and effective resource suggests customized activities, sets practical goals, and sends nudges to remind, all while tracking your effort and results over time. NOTE: Though every effort has been made to create a useful assessment tool for the end user, the authors and publishers make no warranties, express or implied, regarding the accuracy, completeness, timeliness, or usefulness of any information contained or referenced therein. This assessment is not to be used as a substitute for any medical or psychological advice, diagnosis, or treatment of any condition or problem. Users should direct all questions regarding these matters to a licensed clinician. The use of this assessment does not create an express or implied professional relationship. Any actions taken as a result of using this assessment are at the sole discretion of the user, and the author and publishers are not or will not be liable or otherwise responsible for any decision made or any action taken due to the use of this assessment.